Dreaming of owning an exclusive yet affordable home in Bangalore? Then, make this dream come true by becoming a part of the Sobha family. A Rs 28 billion company who has strived for benchmark quality, transparency and robust engineering in its constructions is one of the trusted brands in the country today. For those who are still waiting to find their dream home, Sobha is pre-launching Sobha Dream Gardens in Thanisandra Road very soon. This development will be spreading across a total of 18 acres, offering 1700 units in total. It will provide a choice of 1 and 2 bhk units ranging between 750 Sqft-1084 Sqft. The starting price of 1 bhk apartment here will be 50 Lacs and for 2 bhk its 70 Lacs, which is quite affordable as compared to rest of the projects. There will be total of 10 towers with 2B+G+23 floors that are aesthetically designed and laid out in the given 18 acres. For recreation and relaxation, Sobha is providing a number of amenities within the same community so that they don’t have to go out in search of one. 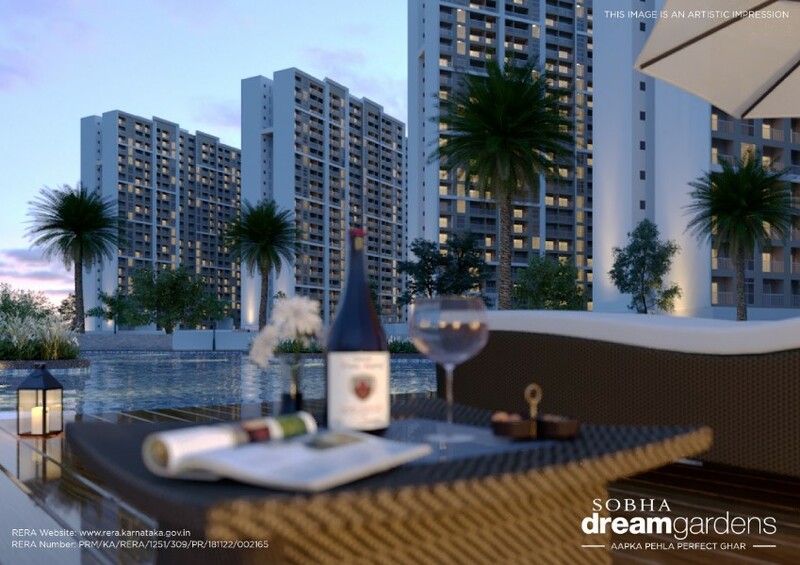 Come reside in Sobha Dream Gardens, the second project of the Sobha Dream Series. The project is located at Bellahalli of Thanisandra Road, North Bangalore. The luxury project Sobha Dream Gardens covers a land area of 17 acres with lush greenery. The project has in total 10 wings with wing 1-9 having B+G+23 floors and wing 10 has 2B+G+17 floors. The housing option provided in Sobha Dream Garden is of varying units like 1BHK, 2BHK regular and 2BHK large for the convenience of the residents. The project also has the RERA approval. Sobha limited being found in the year 1995, has been one of the largest real estate development company in India. Sobha Limited has headquarters in Bangalore, with projects across 13 states and 24 cities. Sobha Limited always strives for the benchmark quality of its developments. Sobha Limited is focused in creating ‘Urban Living Space’ where people can live, work, and play smart. The Sobha Limited has its development in Bangalore, Kerala, Delhi-NCR, Chennai, Coimbatore, Mysore, Pune and many more to follow. Sobha Dream Gardens, along with the housing provides opulence amenities for the residents like Club house, Swimming pool, Children’s play area, Tennis court and Half Basketball court and many more. Sobha Dream Garden is the project by Sobha Developers which has a journey back from 2015, where it started with “Sobha Dream Series”. Sobha Dream Series was initiated with an intention of providing inexpensive and quality homes to working professionals. Under the Sobha Dream Series program the first outcome was Sobha Dream Acres, which has gained enormous triumph. Hence Sobha Dream Gardens is second of its kind by Sobha Developers coming up in Thanisandra Road, assuring to provide inexpensive and quality homes for the home buyers. The specifications provided in the project are best in class. Well crafted Landscape gardens, plastic emulsion paint for walls and ceilings, covered car parking, intercom facility to each unit, sewage water treatment plant, rain water harvesting unit, make the livelihood be in ease. Sobha Dream Gardens is a highly luxurious and a pre-launch project by Sobha Developers. This project is located at Bellahalli of Thanisandra Road in North Bangalore. It is lounged across a total of 17 acres of land surrounded by lush greenery. There will be total of 10 towers with 2B+G+23 floors. This dream of luxury is going to offer 1700 units in total. All the abodes promise to provide a complete relaxation and an ambience for recreation. Sobha Dream Gardens is going to offer several luxurious amenities too like Children's Play Area, Swimming Pool, Tennis Court, Half Basketball Court and a club house. Sobha Dream Gardens is strategically located at Thanisandra in Bangalore. The location is an emerging as it is surrounded by some of the best IT tech parks that contribute to the increase in land appreciation rates. This also an added advantage for potential investors as they wouldn’t find it difficult to look for profitable tenants. The Bangalore International Airport is also in close proximity to the project which enhances the value of the land. Thanisandra is village located in North Bangalore. The major developments happening in this area will be a credit to the expansion of the Thanisandra main road as an alternative road to Kempegowda International Airport. This development has also encouraged the growth of major residential developments in this area. Bangalore Metro Rail Corporation Limited has planned phase 2 line to connect north-south corridor between Nagawara and Gottigere, which has boosted the commuting as well as residential activities in Thanisandra. Some of the Mega projects like KIADB Park, Devanahalli Business park, IT investment Region, Bagalur Finance City, Hardware Park and SHELL Park are yet to be built which enhance the need of choosing Thanisandra. Manyata Tech Park the cluster of IT/ITES professionals as well as the companies is very close to the project, making it to be the most sought residential hub. Thanisandra has Hebbal, Yelahanka, Hennur, Nagawara and HBR Layout as surrounding areas of North Bangalore. All these areas are of good potential for residential developments. Thanisandra is well connectivity through double road (100 ft) to Bellary road. 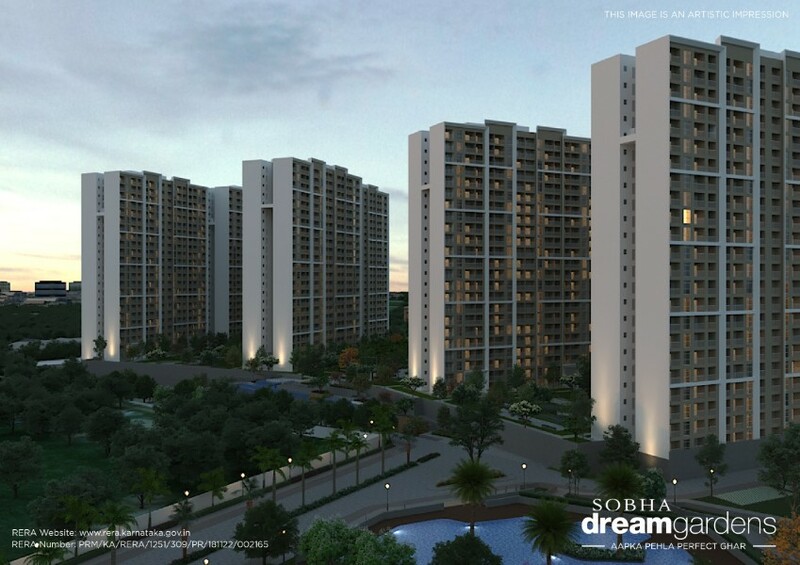 How to reach Sobha Dream Gardens from Kanakapura road? Sobha Dream Gardens is located in Belahalli of Thanisandra road, it takes one and a half hour to reach the destination form Kanakapura road. From Kanakapura road head north towards Pipeline road, now turn left to merge onto NH 48. After a while take the exit on the right towards Vidyaranyapuram-Nanjanagudu road. Take a ramp on right onto NH 75, which is a partial toll road. Turn left after Metro Pillar Number 396, stay left on NH 75. Now move onto NH 44, exit onto the service road after a while turn right to Down Bazaar of Kogilu main road. Keep moving on Kogilu main road to take a turn towards Kannur road. Continue on Kannur road, make a U-turn to reach the destination. How to reach Sobha Dream Garden from Whitefield? 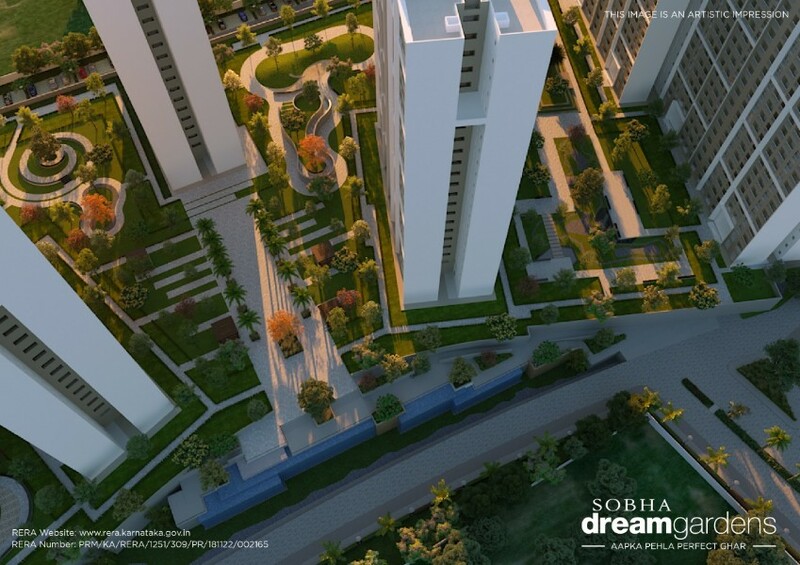 To reach Sobha Dream Garden from Whitefield it takes 57 minutes, via whitefield- Hoskote road. Head north on Whitefield main road towards outer circle, continue onto Whitefield- Hoskote road. Now continue straight onto Kadugodi Fly Over or Whitefield- Hoskote road. Turn keft at Gorivegere main road, continue onto Budigere road. Turn left and continue onto Kammasandra road, turn left to stay on Kammasandra road. Turn right at Gajapathiraj Poultry farm, turn right at Kada Agarahara cross, turn left at Government Lower Primary School Doddenahalli. Turn right at Sri Gayathri Darshini onto Hennur-Bagalur road or Hennur main road. Turn left at Kannur and continue onto Kannur road to reach the Destination. How to reach Sobha Dream Gardens from Bannerghatta Road? Sobha Dream Gardens is located in Thanisandra road, so it takes 1 hour 32 mins to reach Bannerghatta road from this project via Outer Ring Road. Head north on Thanisandra main road towards RKH 1st main road, turn left after Muthoot Fincorp Limited, now turn left onto the 2nd main road. Again turn right at 1st cross onto Thanisandra main road, continue straight to stay on Thanisandra main road. Take a right turn after the gas station, keep right to continue onto NH44/ NH75. Turn right to stay on NH75 again turn left at 1st cross onto ORR. Continue onto NICE Bangalore-Mysore Expressway. Take the exit onto NH48 and take exit towards Bannerghatta road, turn right onto bannerghatta main road, turn right onto Bannerghatta road. How to reach Sobha Dream Gardens from Electronic city? Sobha Dream Gardens is located in Thannisandra road, so to reach the project from Electronic city one has to head southeast on NH 44/48. Travel through Electronic phase 1; now take Bangalore-Chennai highway or Electronic Flyover to Hosur road or the Silk board flyover in KAS officer’s colony. Continue on to NH44/NH75 in Krishna Reddy Industrial estate from 100 ft road and Swamy Vivekananda road. Now keep moving on NH44/NH75 to Thanisandra main road in RK Hegde Nagar to reach the destination. How to reach Sobha Dream Gardens from Hebbal? To reach Sobha Dream Gardens it takes 27 mins via Thanisandra road from Hebbal. From Thanisandra main road, head north towards RKH 1st main road. Turn left after Muthoot Fincorp Limited. Turn left towards 2nd main road, turn right at 1st cross onto Thanisandra main road, and continue on the same road. Move onto NH44/NH75, turn left towards service road. Turn left onto Veerannapalya main road; turn right after State Bank of India. Now turn left onto 2nd cross road, continue onto 6th main road to reach Hebbal. How to reach Sobha Dream Gardens from Tumkur Road? Sobha Dream Gardens is located in Thanisandra main road, so head north to Thanisandra main road towards RKH 1st main road, turn left after Muthoot Fincorp Limited. Turn left towards 2nd main road; turn right at 1st cross onto Thanisandra main road. Continue straight to stay on Thanisandra main road, right turn after the gas station. Keep right to continue onto NH44/NH75, stay on NH 75, and continue onto NH48 the partial toll road. Turn right at Anjaneya temple, cross SJRS High school. Turn right onto 1st cross onto NH48. So by this time one might have reached Tumkur road to find the destination.